Check out confirmed details about Group G Teams, Schedule, Predictions for the upcoming 2018 FIFA World Cup in Russia. 2014 quarter finalists Belgium are improving their strengths day by day. Failing to qualify in 2006 and 2010, Belgium was even ranked first in FIFA rankings in 2015. Entering the world cup for the first time Latin American nation Panama is currently at 55th position in FIFA rankings. Can the debutants show what it takes to survive in world cup? Making their appearance after 12 years, Tunisia has played in world cup for only four times. Tunisia has not been able to qualify for round of 16 yet. After shocking exit in group stage in 2014 world cup then in round of 16 in 2016 European cup, England has to show their best game to avoid the critics. They have won the world cup in 1966 , but can they do it again ? Belgium won 9 of total 10 games in qualifying stage while England won 8. Both teams easily qualified for the world cup and are favourite to advance to the round of 16. It is difficult to say which team would bag which position but this group is set for an exciting thriller. With star players like Hazard, Lukaku, De Bruyne in Belgium and Kane, Cahill, Sterling in England- It would be a delight to watch these European Giants playing against each other. This match would be on June 28. 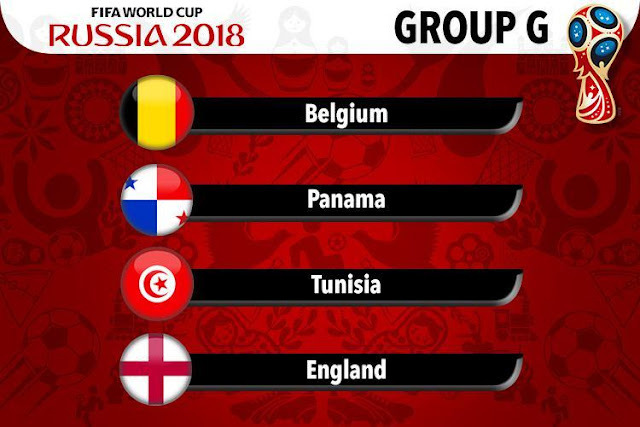 While 2004 African champions Tunisia won their every match in qualifying campaign they still don’t seem to match the skills of European giants Belgium and England. Panama was able to qualify by beating the odds and securing a position above 2017 CONCACAF champions USA. But having the similar case like Tunisia it seems difficult for them to qualify for round of 16 when others are almost assured of it.